The Warm Heart Biochar Research project develops new, inexpensive biochar technology and fertilizers for poor farmers. Warm Heart tests not only under clean, scientific conditions, but in the real world of farmers’ fields – and this is what they have to say about biochar after the experience. Making biochar removes three tons CO2 from the atmosphere for every ton produced; when added to fields as a soil amendment, that carbon is permanently sequestered. Eliminating the practice of open burning of crop residues by “pyrolyzing” them into biochar does more than remove CO2 from the atmosphere. Around the world field burning creates 330,000 gigatons of black carbon annually – the 2nd biggest contributor to global warming – and huge quantities of methane and NOx, greenhouse gases 25 and 298 times respectively more warming than CO2. How is biochar a solution to the smoke? Watch this short video to see a Biochar oven at work. (What you won’t see is any smoke!) This is a newly received video from Malawi where Warm Heart’s influence has sparked interest in biochar to clear the air, restore the soil and provide smokeless cooking charcoal. Our groundwater and much of the marginal land farmed by the rural poor are contaminated with pesticides, industrial chemicals, effluents from dumps and mine tailings. Their presence in the soil ensures that they enter the food chain through either crops or freshwater food sources. The high pH of biochar encourages colonies of microbes that can break down many toxins and biochar’s surface chemistry adsorbs others to the biochar itself such that they are “locked up.” Once locked up, they are no longer bioavailable and cannot harm people. As a soil amendment biochar can prevent toxins from entering the food chain or water; families can use it as a simple and inexpensive water filter media. As biochar proves itself, Warm Heart hopes to see a strong market established. Once it becomes clear that the making and use of biochar have so many valuable attributes, we expect to see government and entrepreneurial interests grow. For governments, biochar production provides a realistic solution for the perennial, costly public health problems caused by field burning. For entrepreneurs, making and brokering basic biochar, manufacturing biochar making machines, producing biochar soil amendments, and innovating new technologies that embody this technology (for example, in-field run-off water filters) offer great business opportunities and will create jobs in job-poor rural areas. The Biochar Benefits Research Project has an R+D facility and lab on the Warm Heart main campus. It operates an Experimental Farm to test biochar fertilizers and a Demonstration Farm to focus group technologies, products and training materials. Locally, Warm Heart collaborates with the Chief Agricultural Officer and Chief Social Development Officers of Phrao District, as well as the Chief Executives of three sub-districts. 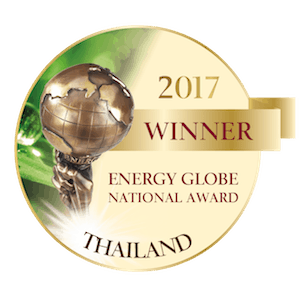 Warm Heart also collaborates with the Governor and Deputy Governor of Chiang Mai Province and the northern Representatives of Ministries of Agriculture, Energy, and Environment and Natural Resources. Farmers can use biochar to make highly effective fertilizer to increase their yields without purchased chemical fertilizers, saving money and protecting the environment. Applied to fields, biochar increases soil porosity and water retention, raises pH, encourages soil life, and improves soil fertility. It also protects crops against disease, fungi, and insects. 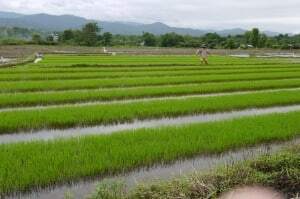 Warm Heart field tests demonstrate that biochar soil amendments outperform synthetic fertilizers in rice paddies by more than 10% and outperform synthetics by far larger margins in steep corn fields with highly degraded soils. The production and use of biochar have major public health benefits. Much attention is given to the problem of urban air particulate pollution, but little to the often extreme levels of PM 10 and PM 2.5 air pollution in rural areas, which actually exceed levels found in urban areas. These particulates result largely from field burning and most can be eliminated with extensive biochar production. The large-scale use in soil can reduce the bioavailability of poisons, decontaminate water flows, and help to remove toxins from the food chain.